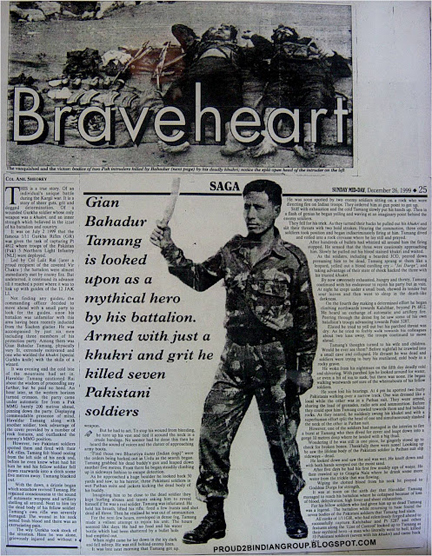 Havaldar Gyan Bahadur Tamang was part of the CO’s column of attack on the night during Operation Vijay in 1999. The hair-raising story of his exploits during the attack is exemplary. Gyan Bahadur Tamang was ordered to move behind an enemy position to cut them off from their reinforcements . The enemy spotted the movement and in the fire-fight that ensued, Havaldar Gyan Bahadur and his buddy were separated from others. In the exchange of fire, both were hit. While his colleague made the supreme sacrifice, Gyan Bahadur Tamang fell backwards and rolled downhill some twenty metres before he passed out with blood oozing from his neck. A light drizzle revived him the next morning and he came to his senses with the sound of automatic weapons and artillery shells landing all around him. He was soon spotted and eight Pakistani soldiers began to fire on him with their AK-47 assault rifles while he dashed around from one boulder to another. Displaying remarkable shooting skills under extreme pressure and with utmost fire discipline, Gyan Bahadur Tamang shot dead three Pakistanis. Soon dense fog enveloped the area. Taking advantage of poor visibility, Gyan Bahadur Tamang made good his escape to rejoin the battalion. Bleeding profusely, low on ammunition, his rifle severely damaged, thirsty and hungry, he tore his vest and tied it around his neck to reduce the loss of blood. He wandered around in the fog till he fell asleep exhausted. The next morning, he woke up with a start startling two Pakistani soldiers who quickly turned on him and asked him to surrender at gunpoint. Displaying remarkable presence of mind, he employed the oldest ruse in the world by yelling and waving at an imaginary point behind the Pakistanis. As they turned around, he pulled out his khukri and slit their throat with two deft swishes. However, the commotion brought out more Pakistanis and Hav Gyan Bahadur was fired upon for over half an hour from several directions. He dived into a small depression and waited with baited breath for the firing to end. After some time, two Pakistanis including a JCO cautiously approached him. Pretending to be dead, Gyan Bahadur Tamang lay absolutely still, his khukri hidden under his body. As one of the Pakistanis kicked him to see if he was dead, he sprang at them with ‘Jai Mahakali Ayo Gorkhali’ and, before the petrified Pakistanis could react, he hacked them to death, ran, rolled, jumped and rolled downhill as bullets whizzed around him. At night, he crept under a bush, chewed its tender leaves for energy before he fell asleep, completely exhausted. Suffering from acute loss of blood, dehydration, high fever and complete exhaustion, Hav Gyan Bahadur woke up the next morning unsure of his bearings. Lacking the strength to make another attempt to rejoin his battalion on Khalubar, he half walked, half stumbled downhill. He spotted two burly Pakistanis walking towards him carrying grenades and ammunition and chatting. There was nowhere to run. He hid behind a boulder close to the track and, with a superhuman effort, once again shouting the battlecry pounced on them with his ever-ready khukri. Startled, the Pakistanis dropped their loads and ran. Tired and on the verge of despair, Havaldar Gyan Bahadur Tamang continued his rather eventful journey downhill till he finally stumbled into the battalion’s rear near Yaldor village. The soldiers of 1/11 Gorkha Rifles while mopping up, found the bodies of all the seven Pakistani soldiers who fell to Gyan Bahadur ‘s khukri. Havaldar Gyan Bhadur Tamang was awarded Sena Medal (Gallantry) for displaying exemplary bravery & courage during Kargil War. Seals revile truth about Bin Lauden raid…. Osama Bin Laden was killed within 90 seconds of the US Navy Seals landing in his compound and not after a protracted gun battle, according to the first account by the men who carried out the raid. The operation was so clinical that only 12 bullets were fired. The Seals have spoken out because they were angered at the version given by politicians, which they see as portraying them as cold-blooded murderers on a kill mission. They were also shocked that President Barack Obama announced Bin Laden’s death on television the same evening, rendering useless much of the intelligence they had seized. Chuck Pfarrer, a former commander of Seal Team 6, which conducted the operation, has interviewed many of those who took part for a book, Seal Target Geronimo, to be published in the US this week. The Seals own accounts differ from the White House version, which gave the impression that Bin Laden was killed at the end of the operation rather than in its opening seconds. Pfarrer insists Bin Laden would have been captured had he surrendered. There isn’t a politician in the world who could resist trying to take credit for getting Bin Laden but it devalued the intelligence and gave time for every other Al-Qaeda leader to scurry to another bolthole, said Pfarrer. The men who did this and their valorous act deserve better. It’s a pretty shabby way to treat these guys. The first hint of the mission came in January last year when the team’s commanding officer was called to a meeting at the headquarters of joint special operations command. The meeting was held in a soundproof bunker three stories below ground with his boss, Admiral William McRaven, and a CIA officer. They told him a walled compound in Pakistan had been under surveillance for a couple of weeks. They were certain a high-value individual was inside and needed a plan to present to the president. It had to be someone important. So is this Bert or Ernie? he asked. The Seals nicknames for Bin Laden and his deputy Ayman al-Zawahiri are a reference to two Muppets in Sesame Street, one tall and thin and the other short and fat. We have a voice print, said the CIA officer, and were 60% or 70% certain it’s our guy. McRaven added that a reconnaissance satellite had measured the targets shadow. Over 6ft tall. When McRaven added they would use Ghost Hawk helicopters, the team leader had no doubt. These are the most classified, sophisticated stealth helicopters ever developed, said Pfarrer. They are kept in locked hangars and fly so quiet we call it whisper mode. Over the next couple of months a plan was hatched. A mock-up of the compound was built at Tall Pines, an army facility in a national forest somewhere in the eastern US. Four reconnaissance satellites were placed in orbit over the compound, sending back video and communications intercepts. A tall figure seen walking up and down was named the Pacer. Obama gave the go-ahead and Seal Team 6, known as the Jedi, was deployed to Afghanistan. The White House cancelled plans to provide air cover using jet fighters, fearing this might endanger relations with Pakistan. Sending in the Ghost Hawks without air cover was considered too risky so the Seals had to use older Stealth Hawks. A Prowler electronic warfare aircraft from the carrier USS Carl Vinson was used to jam Pakistan’s radar and create decoy targets. Operation Neptune’s Spear was initially planned for April 30 but bad weather delayed it until May 1, a moonless night. The commandos flew on two Stealth Hawks, codenamed Razor 1 and 2, followed by two Chinooks five minutes behind, known as Command Bird and the gun platform. On board, each Seal was clad in body amour and nightvision goggles and equipped with laser targets, radios and sawn-off M4 rifles. They were expecting up to 30 people in the main house, including Bin Laden and three of his wives, two sons, Khalid and Hamza, his courier, Abu Ahmed al- Kuwaiti, four bodyguards and a number of children. At 56 minutes past midnight the compound came into sight and the code Palm Beach signaled three minutes to landing. Razor 1 hovered above the main house, a three-story building where Bin Laden lived on the top floor. Twelve Seals roped the 5ft-6ft down onto the roof and then jumped to a third-floor patio, where they kicked in the windows and entered. The first person the Seals encountered was a terrified woman, Bin Laden’s third wife, Khaira, who ran into the hall. Blinded by a searing white strobe light they shone at her, she stumbled back. A Seal grabbed her by the arm and threw her to the floor. Bin Laden’s bedroom was along a short hall. The door opened; he popped out and then slammed the door shut. Geronimo, Geronimo, Geronimo, radioed one Seal, meaning eyes on target. At the same time lights came on from the floor below and Bin Laden’s son Khalid came running up the stairs towards the Seals. He was shot dead. Two Seals kicked in Bin Laden’s door. The room, they later recalled, smelt like old clothing, like a guest bedroom in a grandmother’s house. Inside was the Al-Qaeda leader and his youngest wife, Amal, who was screaming as he pushed her in front of him. No, no, don’t do this! she shouted as her husband reached across the king-size bed for his AK-47 assault rifle. The Seals reacted instantly, firing in the same second. One round thudded into the mattress. The other, aimed at Bin Laden’s head, grazed Amal in the calf. As his hand reached for the gun, they each fired again: one shot hit his breastbone, the other his skull, killing him instantly and blowing out the back of his head. Meanwhile Razor 2 was heading for the guesthouse, a low, shoebox-like building, where Bin Laden’s courier, Kuwaiti, and his brother lived. As the helicopter neared, a door opened and two figures appeared, one waving an AK-47. This was Kuwaiti. In the moonless night he could see nothing and lifted his rifle, spraying bullets wildly. He did not see the Stealth Hawk. On board someone shouted, Bust him!, and a sniper fired two shots. Kuwaiti was killed, as was the person behind him, who turned out to be his wife. Also on board were a CIA agent, a Pakistani-American who would act as interpreter, and a sniffer dog called Karo, wearing dog body armor and goggles. Within two minutes the Seals from Razor 2 had cleared the guesthouse and removed the women and children. They then ran to the main house and entered from the ground floor, checking the rooms. One of Bin Laden’s bodyguards was waiting with his AK-47. The Seals shot him twice and he toppled over. Five minutes into the operation the command Chinook landed outside the compound, disgorging the commanding officer and more men. They blasted through the compound wall and rushed in. The commander made his way to the third floor, where Bin Laden’s body lay on the floor face up. Photographs were taken, and the commander called on his satellite phone to headquarters with the words: Geronimo Echo KIA Bin Laden enemy killed in action. This was the first time the White House knew he was dead and it was probably 20 minutes into the raid, said Pfarrer. A sample of Bin Laden’s DNA was taken and the body was bagged. They kept his rifle. It is now mounted on the wall of their team room at their headquarters in Virginia Beach, Virginia, alongside photographs of a dozen colleagues killed in action in the past 20 years. At this point things started to go wrong. Razor 1 took off but the top secret green unit that controls the electronics failed. The aircraft went into a spin and crashed tail-first into the compound… The Seals were alarmed, thinking it had been shot down, and several rushed to the wreckage. The crew climbed out, shaken but unharmed. The commanding officer ordered them to destroy Razor 2, to remove the green unit, and to smash the avionics. They then laid explosive charges. They loaded Bin Laden’s body onto the Chinook along with the cache of intelligence in plastic bin bags and headed toward the USS Carl Vinson. As they flew off they blew up Razor 2. The whole operation had taken 38 minutes. The following morning White House officials announced that the helicopter had crashed as it arrived, forcing the Seals to abandon plans to enter from the roof. A photograph of the situation room showed a shocked Hillary Clinton, the secretary of state, with her hand to her mouth. Why did they get it so wrong? What they were watching was live video but it was shot from 20,000 feet by a drone circling overhead and relayed in real time to the White House and Leon Panetta, the CIA director, in Langley. The Seals were not wearing helmet cameras, and those watching in Washington had no idea what was happening inside the buildings. They don’t understand our terminology, so when someone said the insertion helicopter has crashed, they assumed it meant on entry, said Pfarrer. What infuriated the Seals, according to Pfarrer, was the description of the raid as a kill mission. I’ve been a Seal for 30 years and I never heard the words kill mission, he said. It’s a Beltway [Washington insiders] fantasy world. If it was a kill mission you don’t need Seal Team 6; you need a box of grenades. Hooyah! Thanks Mel! As Paul Harvey would say: You now know the rest of the story! Please pass this on to everybody in your e-mail address book. John and Judith In God we trust! If you can read this…thank a teacher. If you are reading it in English…thank a Veteran.